Good Stuff NW: Summer Salad Smackdown: Celebrate the Sun! It's the peak of the harvest at farms and markets in Oregon, and it's all the sweeter for the waiting. Contributor Jim Dixon of RealGoodFood gives us one way to make the best of it. As a lifelong resident of western Oregon, I can truly say that this summer sucked when it came to weather. The last few days acquitted the year a bit, but they really couldn’t make up for the cold and wet of spring, July and almost all of August (June is always rainy, so I’m willing to let that month go). Whatever you might believe about global climate, what’s making our seasonal lives, if not really miserable, at least less pleasant than we’d like, is La Niña. I’m not going to even try to explain it—just go here. Very helpful charts and data, but the bottom line is that it’s coming back next year. And that’s your good news for the week. On a brighter note, the hot weather makes corn taste great. I got some amazing corn from Sauvie Island at New Seasons, and I made this. 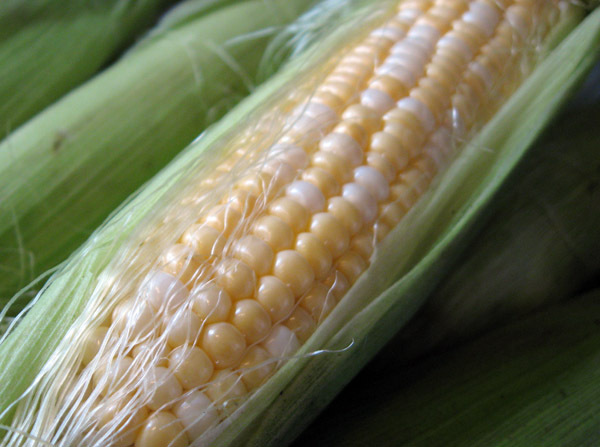 Cut the kernels from a few ears of corn. It's messy no matter how you do it; I like to shuck the ears, break them in half, and put the relatively flat broken end on the cutting board, then slice the kernels off with sharp knife. Cook them in extra virgin olive oil over medium high until they brown just a bit, maybe 5-8 minutes. Slice a sweet onion thinly (or a shallot, regular onion, or another allium); mix with a healthy splash of good vinegar (one of the Katz late harvest vinegars, with their slightly sweet flavor, work really well) and let sit for a few minutes. Slice a bunch of cherry tomatoes in half (or cut some full-sized ones into small pieces). Pick the leaves from a few stems of fresh oregano (other herbs may be substituted). Soak a couple of tablespoons of salt-packed capers, chop coarsely and combine with everything else. Drizzle with good oil, sprinkle with flor de sal, eat at room temperature.